Early, early start to pray the real Stations of the Cross. Calvary and tour of the whole Church of Holy Sepulchre. We settled into our benches for our High Mass with Francisans at the Tomb of Christ. The Western Wall on Bar Mitzvah day is always a unique and colorful experience then a free afternoon to explore, pray, rest or whatever the pilgrims wanted to do. Watch Part 2 with Comments, Farewells and final thoughts. I cannot give an answer that would satisfy the sarcastic interlocutor without a great deal of time and even then he will only listen if he wants to. But, one has to realize that God deals with different people in different ways within their times, their knowledge and their cultural confines. Also, much of the Mosaic Law was to punish the Israelites for their stubborn, stiff-necked rebellion against God which was not imposed on all men for all time. I suggest that the whole problem here is that our e-mailer has a bone to pick and has very little historical or biblical understanding, or he wouldn’t ask such things. In ancient cultures slavery was a way of life. Life was cheap and slaves were property that could be treated and disposed of any which way. That was a fact of life. The very fact that Moses wrote laws to protect the servant with certain legal and moral safeguards put the Israelites light years ahead of the neighboring nations. Slaves with rights—unheard of! But also, the e-mailer should realize that the term slave here can be misleading in that it may very well refer to a bond servant or maid. In early America, many people were able to afford immigration by selling themselves as bondservants for a time. In any regard, over time the full revelation of God impressed men with a more comprehensive understanding and practice of justice and dignity for human life. 2) A friend of mine feels that even though eating shellfish is an abomination – Lev. 11:10, it is a lesser abomination than homosexuality. I don’t agree. Can you settle this? Are there ‘degrees’ of abomination? Yes there are degrees and the differing extent of punishments reflected the degrees. 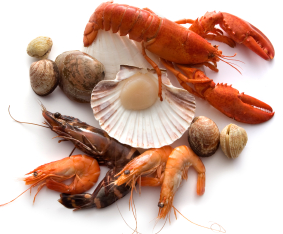 The laws concerning shellfish were not part of the Noahide laws (Gen 9) relating to all men. They were only applied to the Israelites under the Mosaic Law. Shellfish laws were not applicable to Gentile Christians in the NT (see Acts 15). The Mosaic laws and proscriptions are not universal, they were local and for a specific people for a specific time. They were intended partly to make Israel separate from the nations. It was selectively applied to one people, not universally to all mankind. But, homosexuality is prohibited both to the Israelite and in the NT to all people because it is a violation of natural law as well as the written Law of God. It is a universal prohibition. Shellfish are not part of the moral law. The MORAL commands apply to all men. They are universal axioms. They are declared in the Old Testament and carried on into the New. Homosexuality is condemned in the OT and also in the NT eating lobster is not. The e-mailer must also realize that all 613 Laws of Moses are no longer binding on the Christian, or mankind in general, though the basic Ten Commandments are. Stealing, lying, murder are morally wrong and apply to all men. Jesus not only requires our obedience to the Ten Commandments but even ups the ante! I have a study on my website about our continuing obligation to the Big Ten. 3) When I burn a bull on the altar as a sacrifice, I know it creates a pleasing odor for the Lord – Lev.1:9. The problem is, my neighbors. They claim the odor is not pleasing to them. Should I smite them? Even a cursory reading of Leviticus makes it clear bulls were not burned in everyone’s back yard therefore offending neighbors. We do burn cow flesh in our back yards today though, in fact I have a prime rib grilling now. The sacrifice went to the tabernacle or the temple where such sacrifice would not effect the neighbor across the fence. But, why kill bulls? Because Egypt worshiped bulls and Israel rejected God in their insane desire to continue “bull worship” which they learned in Egypt. They built a Golden Calf and bowed before it saying, “This is the god that brought us out of Egypt.” It was easier for God to get the Jews out of Egypt than to get Egypt out of the Jews. They were ordered to kill cattle to constantly remind them that cattle were NOT gods. Also, sin is odious to God and death shows just how horrible sin really is—it brings death. The death of Jesus eliminates the need for animal sacrifice both in back yards and in temples. Does all this mean that God is confused or the Scriptures unfair? Of course not. It just means our questioner did not think clearly or deeply on these matters. The writer of this silly list of questions does not take any of this historical information into account. He just picks up a hammer and starts swinging it around to the detriment of himself and others. I think the words of St. Augustine are appropriate when he said that believing is necessary for understanding. Honesty and a bit of historical and biblical understanding are helpful too.